See for yourself how Ben Lindell mixes Amber Skye’s ‘Howlin’ in the box using Avid Pro Tools 11. 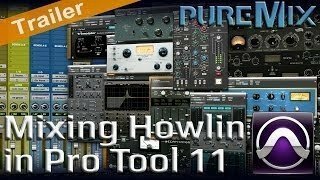 Using his unique approach to routing and a hybrid workflow, he demonstrates and discusses the importance of working on both the details and the big picture of a mix simultaneously. This tutorial will teach you how to approach your mixes like a game of chess, starting with a concept and a vision for the final product and creatively executing the steps necessary to bring a song to life. Ben primarily uses plugins by Universal Audio, Sonnox, Softube, Flux and Soundtoys, showing every move and explaining every decision as he builds the mix around Amber’s vocal. Using creative effects and efficient bussing, Ben enhances and develops the sonic “story” of the song while also defining the overall tone and vibe of the mix. If you struggle with finding consistency and purpose in your mixes, this video will show you how a world class professional tackles both the problems and opportunities presented by modern pop production. Using some of the new features in Pro Tools 11, along with Ben's favorite digital and analog mix-bus processing chain, the song quickly blossoms from a great rough to a final mix before your eyes. In this video Ben Lindell mixes the EWM production of Amber Skye's 'Howling' song. 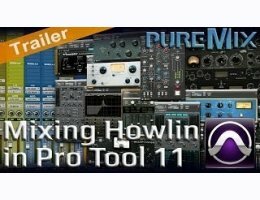 Mixed in the box in Pro Tools 11 with Ben's favorite analog mix-bus processing chain as an insert on the 2-bus, the song blossoms from a great rough to a final mix before your eyes. Ben primarily uses plugins by Universal Audio, Sonnox, Softube, Flux and Soundtoys, showing every move and explaining every decision and spends ample time showing how he gets the vocal sounds for the song. Ben also shows some of the new features of ProTools 11 while mixing the song.